Saint Anne with the Virgin Mary in Apt, France. According to an ancient and uninterrupted tradition of the Church, the body of Saint Anne was carried to Gaul by the same vessel that, in the first century of the Christian era, had brought Lazarus and his sisters there when they had been banished from Palestine because of their faith. These personal and devoted friends of Christ bore her precious remains for safekeeping to the city of Apta Julia (today known as Apt). The body was buried in a crypt, a fact to which the Martyrology of Apt, one of the most ancient in existence, testifies. With the coming of the persecutions and barbarian invasions, the first Bishop of Apta Julia, Saint Auspicius, took precautions to guard this holy deposit from desecration. He buried it in a yet deeper subterranean chapel and sealed all approaches to it until a safer day. Toward the end of the eighth century, when Charlemagne won a last decisive victory over the Saracens in the plains of Province near Montmajour, peace and security returned to the land. The people began to restore and rebuild the holy places destroyed by the invaders. Among these was the cathedral of Apta Julia. The Bollandists say that Charlemagne’s first concern, upon arriving at Apt, was to have the cathedral re-consecrated by Archbishop Turpin during the Easter solemnities. Yet even amid the rejoicing of the people, sadness pervaded, since every effort to find the long-hidden remains of Saint Anne had proven fruitless. It happened that a young noble boy of 14, the son of the baron of Casanova, was present at the ceremony. People near the boy in the sanctuary noted that during the divine service he was carried away by some overpowering emotion. The boy, who had been born deaf, dumb and blind, seemed to be listening with rapt and upturned face to voices from above. Moved by the impulse of grace, he walked toward the high altar and struck the steps leading up to it with his staff, making signs that they should dig there. His behavior caused no small disturbance during the solemn rites, but neither the clergy nor the royal guards could quiet or restrain him. Charlemagne, deeply impressed by what he saw, ordered that the steps should be excavated after the Mass. The steps to the altar were removed; thereupon everyone saw a door sealed shut with huge stones—the door of the ancient crypt built by the provident Saint Auspicius centuries before. No sooner was this door opened and the flight of steps leading down to it discovered than the blind boy rushed forward as if his eyes were suddenly opened and led the way into the underground church. Charlemagne himself took the boy’s hand and gave orders to hold back the excited multitude. John, the young noble, struck the wall of the crypt to show that they must search yet further. Another and lower crypt was discovered at the end of a long, narrow corridor. There, a sudden beam of bright light flashed upon the king and his attendants. They beheld, in front of a walled recess, a burning lamp which flooded the area with unearthly splendor. As soon as the king and his cortege entered, the lamp went out of its own. More wonderful still, the boy could suddenly see, hear and speak. “The body of Saint Anne, mother of the Virgin Mary, Mother of God, lies in that recess,” were his first words. 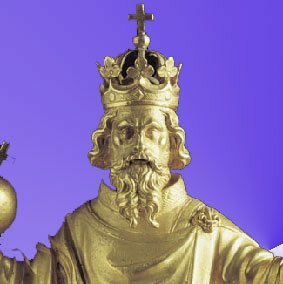 After venerating the relic before all present, Charlemagne had an exact account of the discovery drawn up by one of his notaries and a copy of the same sent to the Pope with the royal seal. This letter and the Pope’s reply still exist to this day. From that time forth, the cathedral of Apt became a center of attraction for Catholic pilgrims from all parts of France. This entry was posted in Focus on History and tagged forntpage by TFP.org. Bookmark the permalink.